Welcome to our online antiques store! 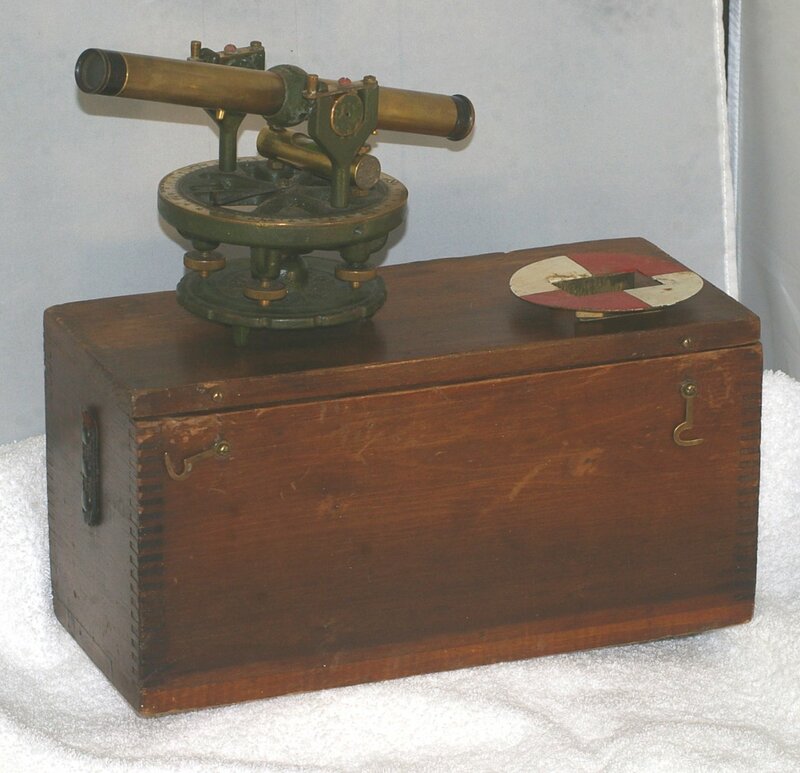 This vintage surveyor's tool is a Geirer & Bluhm Surveyors transit level or theodolite, with the original case. As near as we can determine, it appears to have been made in 1925 by G&B of Troy NY. It has a nice dovetailed wood case. It is a smaller instrument than some (the case is 12"x6"x6"). That combined with the old brass makes it a great item to display on almost any shelf. As you can see in the photos, the instrument is in good condition with an excellent combination of shine and patina on the brass. A lot of the original paint is also present. The spirit level is intact. The leather strap and handle are gone, but that actually makes it easier to display. Otherwise, it's in very good shape, and made exceptionally well. The optics work well, but there is a focusing slider that is missing, and the crosshairs are broken (photo showing view through scope). Both of these could be repaired if desired. Displays beautifully, and could be restored as a project. Copyright © 2019 CoinsAndMoreOnline. Powered by Zen Cart. eCommerce Website design and installation by BrainBridge Systems.